The Long Tail is a concept, first expressed in 2005, that talks about how the Internet is changing the way people consume content. It applies to books, music, movies and DVD rentals – pretty much every form of entertainment product there is out there, and more. I first read about the Long Tail in 2006, shortly after the book was released, and I marked it off as something ‘vaguely interesting’. ‘Vaguely interesting’ pretty much meant ‘this does not apply to what I do’. I thought I understood what it was. I was wrong. I revisited the Long Tail idea today. And I realized much of what is talked about in Alexandra Erin’s guest post is Long Tail in action. 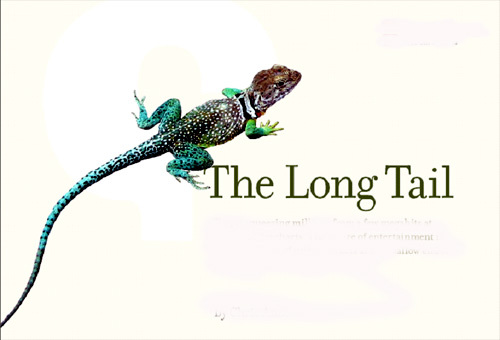 This post explores the Long Tail idea and how it applies to Online Fiction today. In a market with near infinite supply (huge variety of products), a demand will exist for even the most obscure products. Chris Anderson backs up this theory in the first part of his article with numerous examples. The one I like the best is Robbie Van-Adib’s question: ‘what percentage of the top 10,000 titles in any online store (iTunes/Amazon) will rent or sell at least once a month?’ The answer? Not 80/20 like many people suppose – it is 99%. He then concludes that if an inventory is unhindered by space, profit margins (it is very cheap/free to make) and time (there is only 24 hours in a day – which means radio stations are limited in their product offering), user demand will continue to exist for very obscure products. These products then earn the company money, and totaled up may even surpass the sales of the hits. Okay, yeah, fine. The Long Tail rocks for online merchandisers. What about blooks and online fiction? The Long Tail is applied to online fiction in 2 ways. 1. Blooks vs published bestsellers. It is common knowledge that the publishing industry is a bloody business to be in. Traditional publishing houses make their money from a small percentage of their books (usually with a Stephen King or a Harry Potter attached to the name), and they accept only 5% of the work sent in. This means you aren’t likely to get published the traditional way. What this does not mean, however, is that you can’t compete with them. The Long Tail states that as long as you offer good quality, and there exists a system to filter through the rubbish, even you can compete with the big bestsellers. And you’ll profit, because it costs you virtually nothing to distribute and market it. More on this later. Cyberfunded creativity is thus uniquely suited to instances where a writer has something, the fans want it, and editors don’t think there’s a market for it. Just skip ’em and sell direct. This, too is Long Tail in concept. Sorting Through The Rubbish – Still A Problem? It’s pretty hard to imagine people would sort through rubbish, no? Alexandra Erin has in her guest post detailed why this is not a problem; here I’m going to talk about how it is. Now don’t get me wrong. I still agree with her argument, but in this case I’m refining it – taking a look at the problem from another angle. First off: Alexandra is right in saying our target audience more or less is willing to sort through all the dross to find the good gems. We don’t have to do anything about it, if sorting through the dross isn’t a problem. Or do we? The answer is, yes, we do; yes, it still is a problem. Our target audience shouldn’t have to be just people who are willing to sort through the dross: if that’s the case online writing will forever be in the dark, pushed into the corners of the web by other bigger, better, more instantly gratifying web distractions. If, say 1% of web surfers are actively finding/reading online fiction, the ideal solution shouldn’t be just to find that 1%, but to expand upon it. In other words, we should not find a target audience – we have to create one, so the 1% becomes 5%, or more. No, I’m not dreaming. This is possible. Most web surfers already read on the net: blogs, for instance, have been making big splashes ever since bursting into the mainstream. Newspapers are dying out, losing to online news sources, and a good many print publications are making hurried moves into the Internet. We have a ready pool of readers, waiting for conversion. How then, do we expand that 1%? Oh sure, there’s also a lot of crap. But there’s a lot of crap hiding between the radio tracks on hit albums, too. People have to skip over it on CDs, but they can more easily avoid it online, since the collaborative filters typically won’t steer you to it. Filters, it turns out, are still important. But in a different way that we might originally suppose. Our 1% – the target audience already reading online fiction – is not deterred by a lack of filters. The other 99% is. So in order to bring the others in we’ll need ‘collaborative filters that won’t steer you to crap’. The key word here is collaborative. If the existing 1% can somehow pool their resources and their knowledge of online fiction to highlight the gems, online fiction will be more accessible for the next 1%. 1%+1% = 2%, which will now work together, reading, reviewing, commending, and make it even easier for the next 1%. Rinse, lather, repeat. And we already have this mechanism in place! Pages Unbound has exactly this capability, and it can and probably will be essential to all efforts promoting online fiction. There’s only just one problem. In his article, Chris Anderson tells the story of 1997 startup MP3.com. It was a classic Long Tail business – anyone could upload music files, thus bypassing the labels and connecting artists directly to listeners. Only it failed. Struggling bands did not find new audiences, and MP3.com came to be known for a mass of mostly bad music that nobody wanted to listen to (read:crap). Why? The problem with MP3.com was that it was only Long Tail. It didn’t have license agreements with the labels to offer mainstream fare or much popular commercial music at all. Therefore, there was no familiar point of entry for consumers, no known quantity from which further exploring could begin. For instance, the front screen of Rhapsody features Britney Spears, unsurprisingly. Next to the listings of her work is a box of “similar artists.” Among them is Pink. If you click on that and are pleased with what you hear, you may do the same for Pink’s similar artists, which include No Doubt. And on No Doubt’s page, the list includes a few “followers” and “influencers,” the last of which includes the Selecter, a 1980s ska band from Coventry, England. In three clicks, Rhapsody may have enticed a Britney Spears fan to try an album that can hardly be found in a record store. Filters, as it turns out, are very, very necessary. The improved signal-to-noise ratio that comes from following a good recommendation will encourage exploration, thus creating a more vibrant readership of online fiction. What are the fiction ‘hits’ that 99% of the reading Internet are already following? How are we going to connect those ‘hits’ to the Long Tail? I haven’t figured these questions out. But I’ll be keeping an eye out for the answers. Do you guys have them? I’d love to hear from you all. Required reading: Chris Anderson’s original article on the Long Tail. A good part of this post is based on that, so it would be good to give it a read. Also, What Authors Can Learn From Radiohead and Alexandra Erin’s guest post precede this article, so reading it will give an insight to the evolution of the ideas above. An interesting sidenote not completely related to the topic at hand: Inside A Publishing House by Andrew Lownie. Image at top taken from Thoughts On Media.